The summer after the first year of graduate school, I went to Venezuela with a group of fellow graduate students for three weeks on a research project. After the first two days in Caracas, we proceeded to Maracaibo, which was the project site. It didn't take long for many students to grumble about the heat. Our professor casually remarked, "it goes with the territory." I remember that I didn't complain much about Maracaibo's heat and humidity even as the Anglos in the group whined. They had good reasons; the temperature in late-May and early-June when we were there was awful. Maybe the reason I didn't complain then was rather simple--I hadn't known anything better, having been out of the hot Tamil Nadu conditions for only a few months. Since then, I have come to love that phrase, "it goes with the territory." The older I get, the more I appreciate it. Snow in January in Boston? Well, "it goes with the territory." 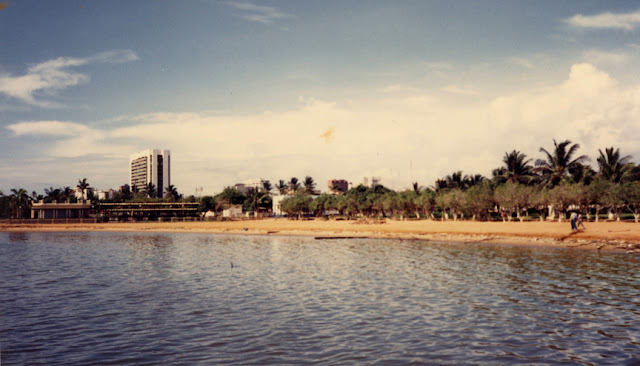 Thus, as much as I would love to complain about the heat and humidity in Chennai, which is almost exactly what I experienced in Maracaibo twenty-six years ago, I know better--"it goes with the territory." Over the years, I have come to understand how "it goes with the territory" is applicable to non-meteorological contexts too. No electricity in rural Tanzania? Mosquitoes in the Alaskan summer? Atrociously small hotel rooms and bathrooms in Venice? "it goes with the territory." But, seriously, this hot? This humd? This blinding sunlight? "But, seriously, this hot? This humid? Have I become this wimpy after twenty-seven years away from this place?" Perish the thought that I have become wimpy? Perish the thought that I can get back to Juanita in Maracaibo?